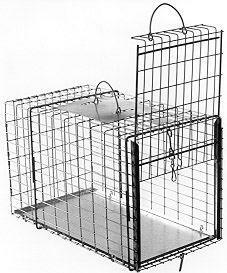 Model 305 is a transfer cage for rabbits, opossums and similar size animals. One end of this cage is a sliding door designed for easy transfer of animals from live traps. Model 306 is a sliding door cage for raccons, cats and similar size animals. One end of this cage is a sliding door designed for easy transfer of animals from live traps. This transfer cage matches up nicely with trap models 606NC, 608NC, 608FN, 608, 608.1, 608.2, 608.3, 608.5, 608SS, 608.2SS, and 608.4SS.